Please find enclosed an open letter in English, French and Spanish from over 50 NGOs worldwide endorsing the proposals by Norway to more correctly address solid waste plastic within the scope of the Basel Convention. We also have available a short fact sheet on countries already beginning to ban or severely restrict plastics. Since our last message on this subject ( BAN Alert #2), Norway has now formally called for a new listing on Annex II. We urge you to support the fundamental principles of the Norwegian proposal at OEWG11. In this way we can move quickly to harness the framework of the Basel Convention to help solve the global plastics waste crisis. Side Event: BAN, Gaia, CIEL and the Break Free From Plastics Movement will be holding a side event on the Noregian Proposal and the Plastic Trade issue at the OEWG -- Wednesday at 18:15 in Room 4. Join Us! 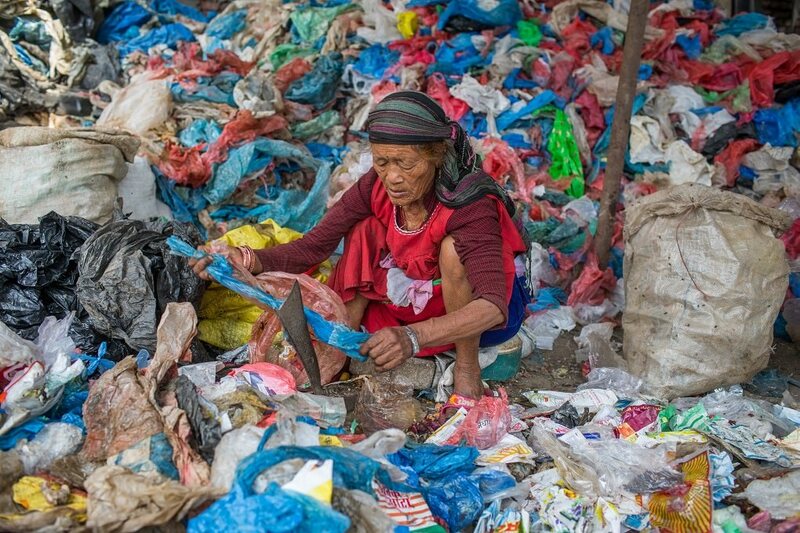 A woman cuts plastic bags that are collected from the Garbage Collection Centre of Katmandu Metropolitian City. Some of the garbage polythene bags are recycled but some are dumped in fields and rivers of Kathmandu Valley. Image: Nabin Baral. Caption by: Eco-Business. We are writing to urge you to support the removal of "B3010: solid plastic wastes" from Annex IX of the Basel Convention on the Control of Transboundary Movements of Hazardous Wastes and their Disposal, and the placement of "Y48: Solid plastic waste, not containing Annex I materials to an extent exhibiting Annex III characteristics, that is contaminated by other materials, and/or mixed with other types of waste, and/or mixed with other plastic materials to an extent which requires special consideration in order to ensure environmentally sound management and minimize the risk of the waste ultimately reaching the marine environment" on Annex II (wastes requiring special consideration) as proposed by Norway. This would make it clear that waste and scrap plastic, while not definitively designated as hazardous waste, would nevertheless be subject to the Prior Informed Consent (PIC) control procedure of the Basel Convention. The global production and trade of waste plastic has grown tremendously over recent decades. However, much of this plastic is single-use and of little or no recycling value, or is destined for processing in substandard recycling operations, often in developing countries that may lack meaningful and adequate regulation or effective enforcement. While this problem has been identified, we currently lack sufficient means to properly quantify and track this potentially damaging trade -- and no means to control it should there be concerns. Without such controls, this form of global plastic dumping under the name of recycling may become epidemic with severe global consequences, including an exacerbation of the marine debris crisis. Until January this year, China was the main recipient of the world's plastic waste, and was forced to burn or bury the residual trash from other countries that couldn't be recycled, leading to massive environmental pollution and public health impacts in host communities processing imported plastic scrap. China has responded to calls to clean up its act by banning the importation of waste plastic and focusing on the collection and recycling of plastic waste generated domestically. Now that China has closed its borders to foreign waste, we are discovering that massive volumes of the same have started to arrive in the ports of Southeast Asian countries, with possibly even less capacity to manage the waste in an environmentally sound manner. to an extent which requires special consideration in order to ensure environmentally sound management and minimize the risk of the waste ultimately reaching the marine environment" on Annex II. This action will ensure that we take the first step towards the transparency and control over plastic waste we desperately need. This step will remove the presumption that "solid plastic waste" is non-hazardous and ensure immediately that category A3050 will be more fully applied for used plastic materials. And, to finalize the necessary action, as signalled by Norway, the placement of "solid plastic wastes" on Annex II as noted above will provide a proper framework where plastics will be subject to transparency and shipment restrictions if needed. Countries have a right to know exactly what is being sent to their shores so that they can make informed decisions that fit the needs of their citizens and their environment. Right now the global and transboundary flows of plastic are largely hidden and countries are faced with finding out about arrivals only after it is too late to take preventative action or careful consideration of the consequences of the import. While China's move to ban plastic imports has sent an important message to the world about the harmful impacts of plastic waste, it has also set in motion many thousands of tons of potentially polluting plastic waste all looking for a new destination, with likely devastating consequences if nations are not allowed the right to know and react to new waste flows. It was precisely for this reason that the Basel Convention and the Prior Informed Consent procedure were created. With a slight adjustment of the annexes of the Basel instrument, we can respond effectively and expeditiously to the current dangerous plastic waste trade and provide early warning and protection to vulnerable countries around the world.